Last night, I held our dog Riley while she died. I want to write about this experience a little bit, for myself, before I forget most of the specifics. If you’ve lost a pet recently or if this is too graphic for you, please skip this. I am just writing this down for myself so that later I have not forgotten what this day feels like. 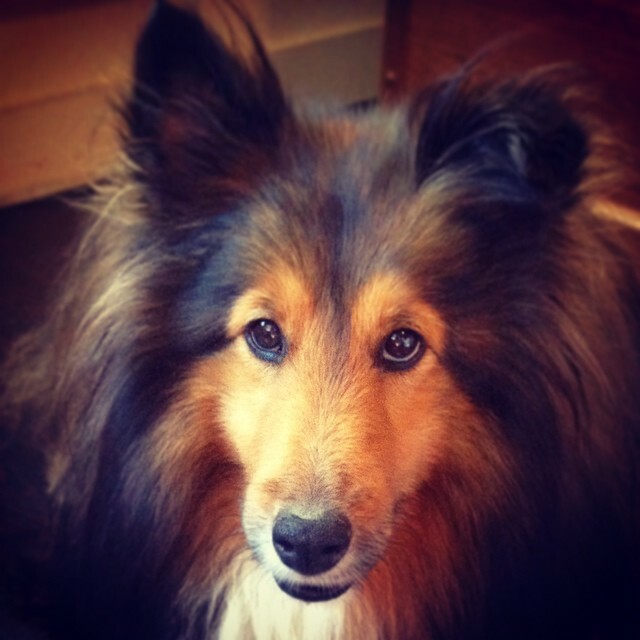 When I first met Jordan, her parents were living in London and she was keeping their Shetland Sheepdog named Maggie in her studio apartment in the West Village, against all bylaws of the building. Eventually she got caught and she had to ship Maggie off to her uncle in Kansas. 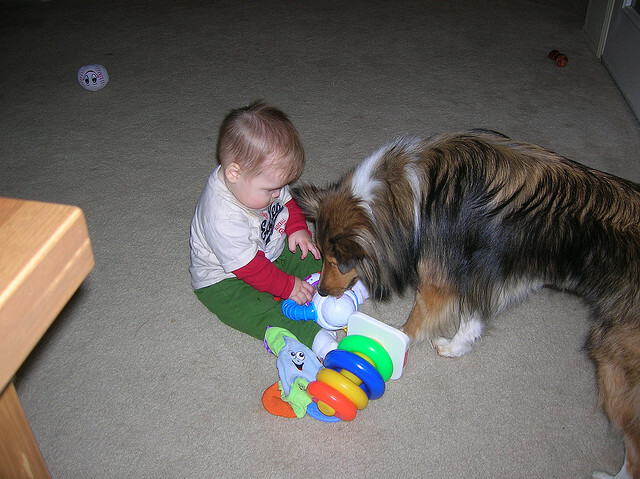 After we were married and decided to move to Austin, Jordan made it clear that one thing she was looking forward to was getting a dog – specifically a Sheltie. “Of course, honey! Whatever you want! 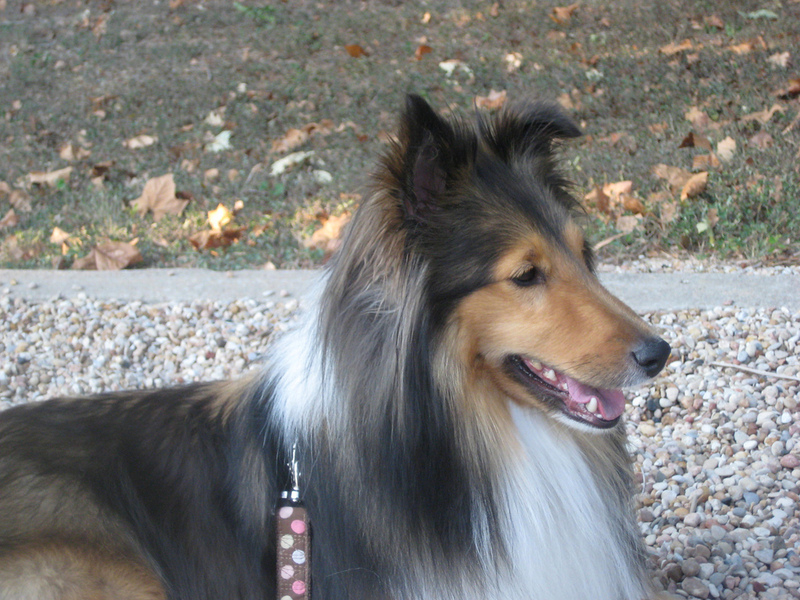 Shelties sound great,” said newlywed Matt. We picked up Riley from a breeder in Oklahoma in 2005 and she became our surrogate child, our furry offspring. All the love and energy we had for the world was transferred onto this animal. We fretted over her nap schedule, bought her the best organic food, took her to obedience school for weeks on end, bought her a designer collar and leash, etc. There was one night where we bought tickets to a theater performance in East Austin and hired a dog-sitter to take care of the puppy (who does this?? 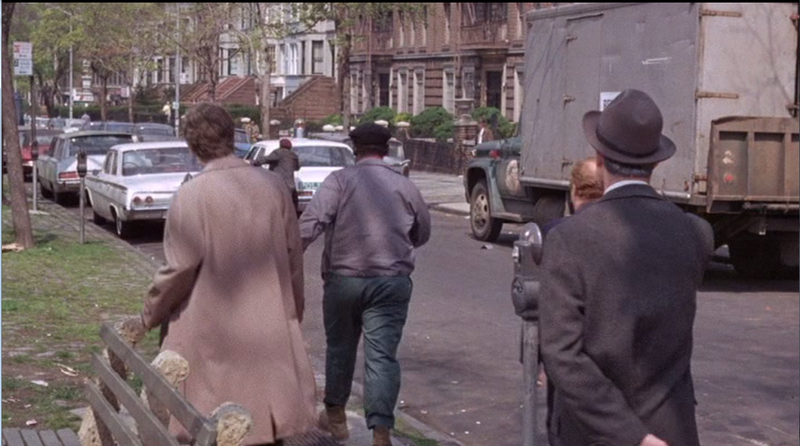 ), but I forgot to put the front-door key to the apartment under the doormat. So I left Jordan at the theater, gave up my ticket, and went back to the apartment to let Riley out and dismiss the dogsitter. One night a few weeks later I thought she had a bowel obstruction so I drove her to an emergency specialist an hour away in San Antonio, where, after thousands of dollars of tests, it was determined that she just had a virus. When Henry was born, we worked with Riley to step around a blanket on the floor–trying to show her that it was the baby’s space and she would have to be careful. But we needn’t worry because she was so sweet and loving with the new baby that she thought it was her own child. I spent several years thereafter walking her on the trails behind our house every day, listening to podcasts, meeting the other dogs in our neighborhood, that she became my constant companion. After Arlo was born, her needs definitely fell behind and she took on the role of an elder statesman who didn’t need as much attention as she’d once demanded. But she was a constant presence in our daily lives, never demanding too much, always willing to receive our love. Last fall, we took her in for a bladder infection that wouldn’t seem to clear up, no matter the course of antibiotics we tried. The vet advised us that she had a tumor that at first looked benign. Two months ago, she had several tumors in her urinary tract that could not be removed without irreparably damaging her urinary system. We began preparing the boys for her demise, but I don’t think we fully comprehended how much we were ignoring our own emotions in service to the children’s potential feelings. A week ago Riley took a turn for the worse and her cancer began to spread. She was no longer able to walk up and down the stairs in our back yard. She stopped eating dog food, though she would nibble on table scraps. She had accidents in the house regularly and by Friday, she had trouble standing up. Thursday was a “snow” day here in Austin and no mobile vets would come out to visit us. I tried getting a home appointment asap but the earliest anyone would promise was Monday. She spent most of Saturday in the middle of the floor of the living room, awake and just listening to us talk. On Sunday morning I had to move her into her bed; she couldn’t stand up at all. I tried again to find a mobile vet who worked on Sundays, but held out hope that she would make it through the night until her appointment on Monday morning. I laid down in the floor with her and held her head as her breathing began to slow. She never once cried or made a painful noise. She remained very dignified and peaceful through everything. At about 12:30 this morning, her whole body pulsed several times, like she was having an aneurysm or a stroke. After that, she slept very soundly for a half hour or so, lightly snoring. Then her breathing became very shallow and she looked up at me one last time before she took her last breath. Even though I knew she was sick for months, even though I had worked to prepare the boys for this day, I was not prepared for the full force of grief that would hit me after she died. I called a mobile pet cremation service to come and pick her up, which they did very gracefully and professionally, but of course I could not sleep after that. I was still in shock that she was really gone. It’s been a rough day since that moment. Jordan and I have alternated between numbness and sheer pain at her absence. She had integrated herself so thoroughly into our daily lives that it had become a reflex to check on her and take care of her and just have her around us all the time. I have never mourned an animal so thoroughly and completely as I have for Riley, and my deepest sympathies are with anyone who has lost a pet, a companion, a friend. She was truly a member of our family and we will miss her forever. The house is too quiet without her. There is a deep human need to be remembered. Most of humanity is forgotten, of course. Many, many people who were successful or beloved or wildly popular are forgotten a generation later. I’ve always been fascinated by books or projects that go back and resurrect a forgotten life and remind us that we have giant gaps in our knowledge of the past. 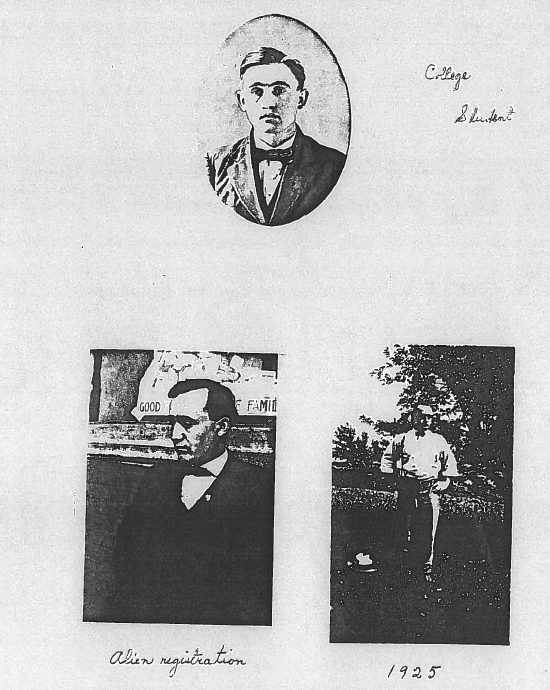 One example is Alain Corbin’s The Life of an Unknown where he picks a name at random from a 19th Century civil registry and researches the history of that particular person as deep and wide as he can. Corbin isn’t writing an academic microhistory there, but actually trying to repair holes in our collective memory. In previous posts on Robert T. Arthur, I was curious about how his daughter, Maude (above), died so young. She was only 23 when she died in 1916. After reading more about her life, I feel like I have discovered a remarkable person. 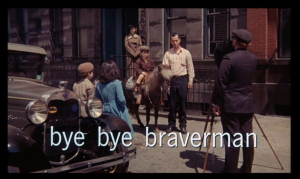 By all accounts, Maude had the trademark personality of a first born child: a leader, smart, willing to please. But tragedy struck her young family when she was 4 years old. Her baby sister, Lenora Fay, only 22 months old, died while the family was in Fort Scott, Kansas. (I’m not sure if Maude was also born in Fort Scott or if this was just a brief stay in Kansas. 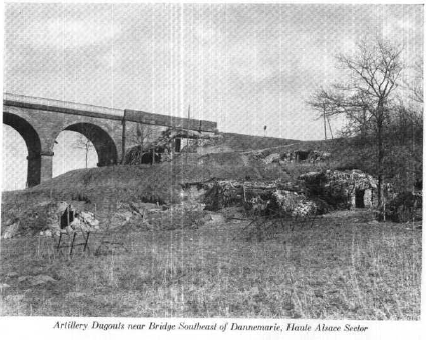 Like Denison, Fort Scott was a Katy Railroad stop and it’s likely he was on assignment there.) 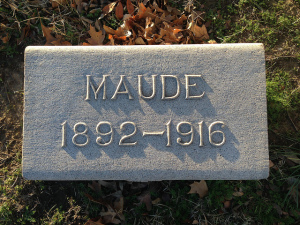 No doubt Maude carried some of her parents’ burden over that unforgettable tragedy throughout her life. Her parents did have another child, another girl, Marie, in 1902 when Maude was already 10. The difference in ages meant they were not likely as close as they would have liked to be. When Marie was ten years old, Maude had already graduated high school. 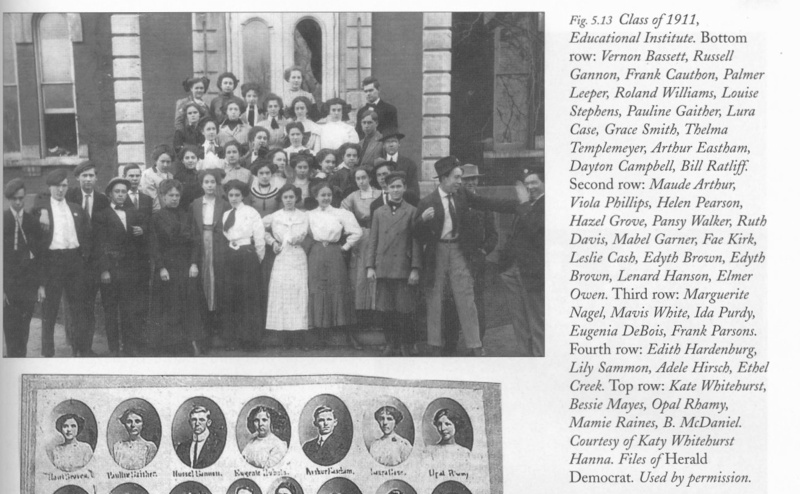 In high school, Maude was at the center of the social world. 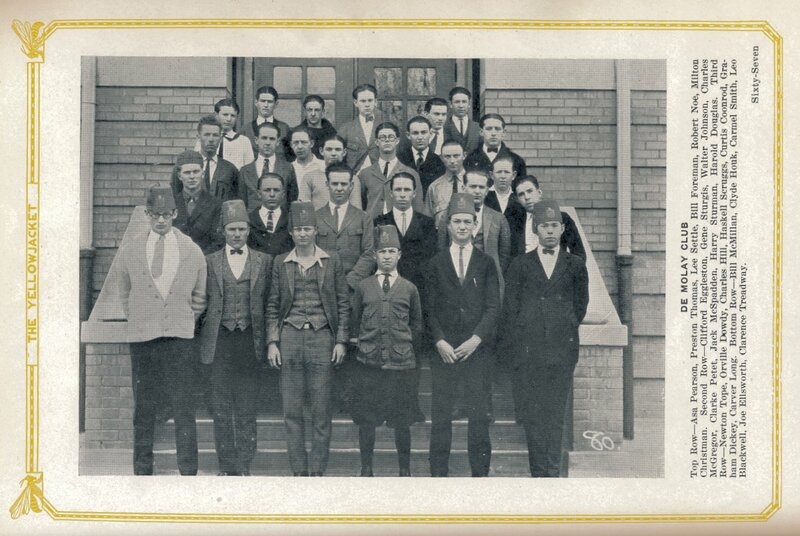 The Denison High School class of 1911 was small, but Maude stood out. 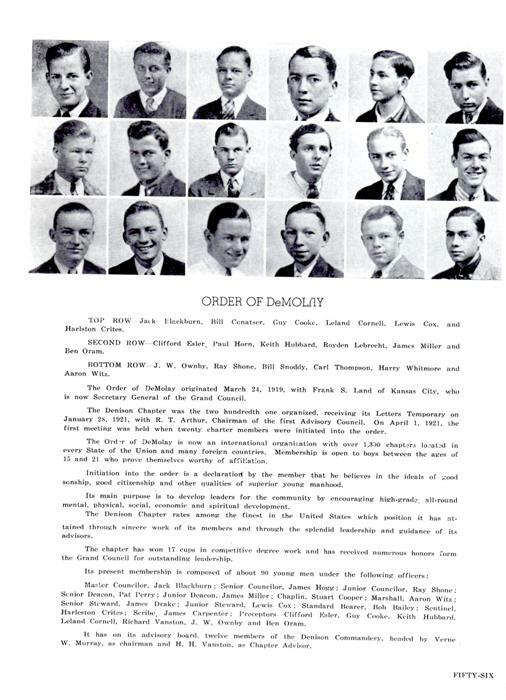 In her junior year she was the Society Editor of the Denison High School Yellow Jacket (the yearbook which also published newsletters at the time). She was also an aspiring writer. 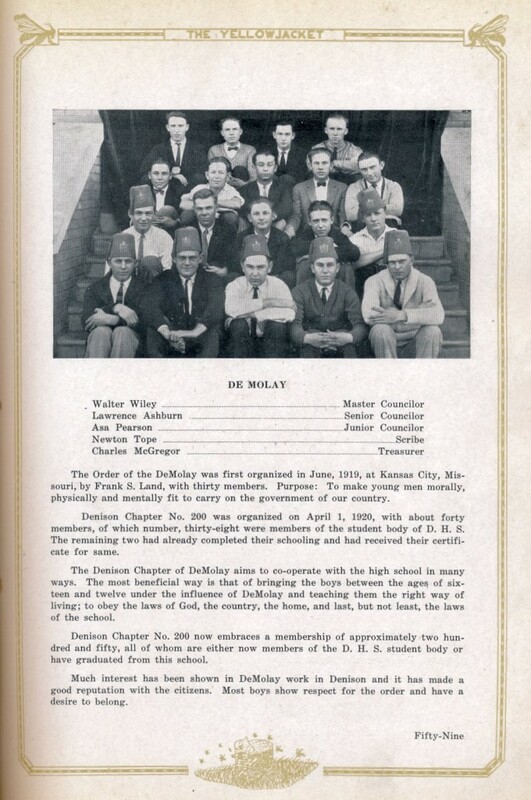 Here is a story she contributed to the Christmas 1910 Yellow Jacket. (I transcribed it below.) I think the story displays incredible maturity for an 18 year-old girl and a real ability at crafting stories. The cottage homes of the Bernhardts stood side by side in exact duplicate with the hanging baskets on the porch and the well laid off vegetable garden in the rear. So was the relation of the families. But of late the Mesdames Bernhardts, who had always begun and ended their house-cleaning seasons on the same day, whose preserves and jellies tallied to a jar and who made their patchwork quilts from the same pattern, had gotten in the habit of shaking their heads and lamenting that Herman and August were not happy any more spending their days in making their compounds or sitting on the green bench in the evenings smoking their long-stemmed pipes. Nowadays the men spent all their time in their laboratory, which stretched along the end of the two yards, and worked in bad smelling messes and evil looking mixtures. “And no good would come of this,” said Mena to Lena. When the cousins took in a partner, a shock-headed young man with a queer uncatchable eye that never looked straight at anyone, Mena said it was nothing than the doings of the unsound minds of the cousins; for outside of this, August, her husband, had talked recently in his sleep about a “solution” that would bring him wealth beyond measure. When questioned about it, he became angry, but finally told her that he had come upon a combination of certain liquids that lacked but one ingredient to make a substance from which the most beautiful jewels could be made. This one ingredient he would find then—hey for fame. He said that Herman had helped a little, but only a very little, the idea was his, August’s and the fame would be given him when the time came. 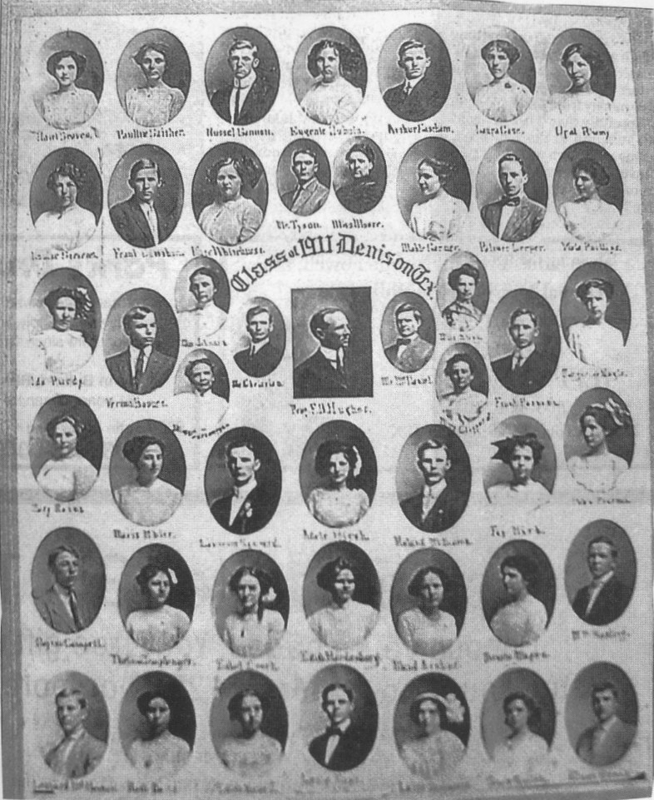 Lena also questioned her husband about the wonderful discovery, Herman seemingly informed her that the fame belonged to him and that August was only helping him. However, she would see when the missing link was found who would get the glory. The new partner who was experienced in chemical matters had been taken on to assist in the detail work and to help along the research for the last ingredient. Then the lives of the two fraus became miserable, for they loved their husbands dearly and they loved each other dearly. They now foresaw the troublesome times ahead. 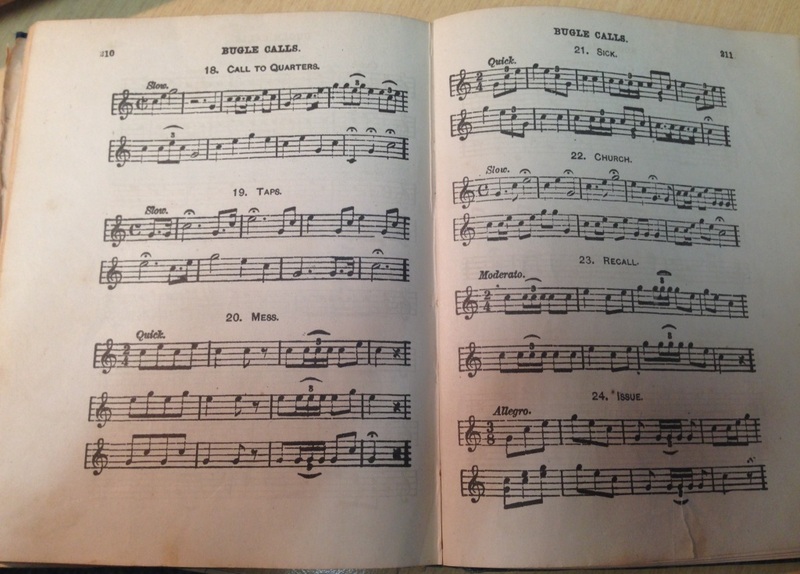 The breach between the two families soon widened; both Herman and August became cross and sullen toward each other and each bade his wife not to visit or have anything to say to the wife of the other. 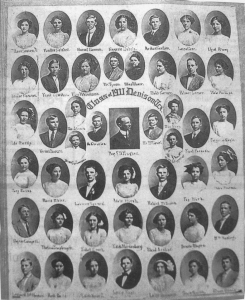 Sorrow and dismay descended on the good wives, whose stolen interviews could not bring much comfort since Herman and August were at the point of blows. One morning a fearful shock came to August and Mena; during the night Herman had stolen away taking with him his wife, the rascally new partner, and all of the precious discovery. Up and down the white-colored kitchen raged the cheated cousin, wrenching his gray hair into wild disorder and bidding Mena hold her tongue when she tried to comfort him. Then his mood changed and he vowed to find his tricky kinsman, though it cost him years of life and hundreds of dollars, and wrest from him the magic compound which he had stolen. This was a vast undertaking. Herman’s house had been shut up, and no one could be found who was able to throw any light on the subject. Soon August prepared to leave on his strange quest. The cottage was locked up, the cat given to a neighbor, and Mena beheld but a quivering mist as, with tear-blurred eyes, she bade farewell to her beloved cabbage garden. Then followed the long, dreary pilgrimage of the aged couple. Now and then vague tidings of Herman’s movements came to them, but finally giving up all hope of finding his cousin, he settled in a little cottage far distant from his old home and fitted up a miniature laboratory where he worked day and night to duplicate the priceless mixture which had been stolen from him. 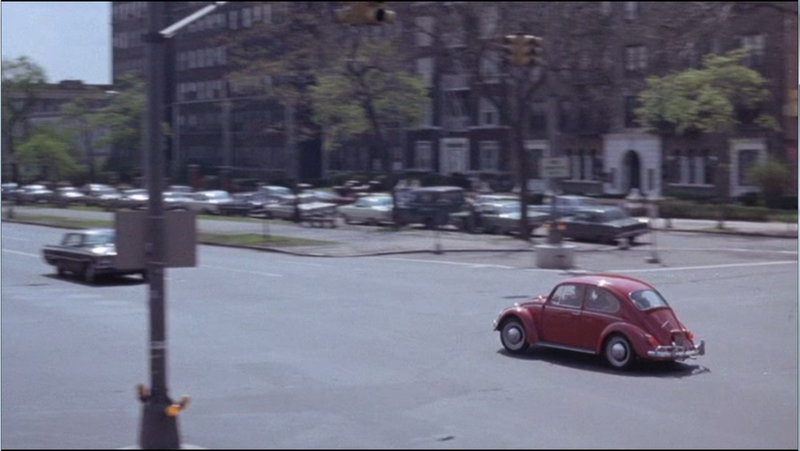 But it was useless as he’d forgotten the very ingredients as well as the details of the process. Some context about this story: Denison High School had recently built a chemistry lab on campus. 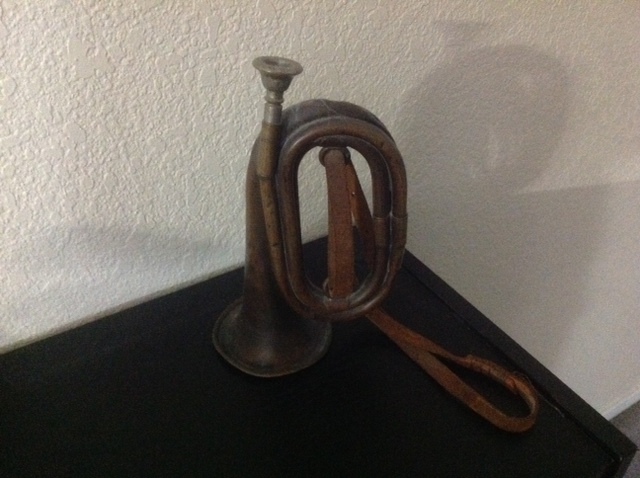 It was considered the height of sophistication and scientific advancement. Marie Curie was all over the newspapers then, having won the 1903 Nobel Prize in physics (she would also win the 1911 Nobel Prize in chemistry). 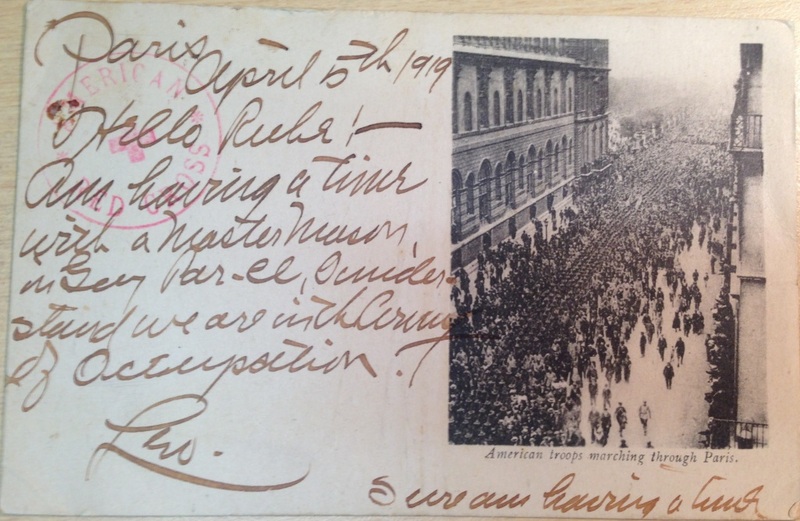 The women’s suffrage movement was acquiring an air of inevitability and progressive young women, like Maude, were looking to do more than study home economics. 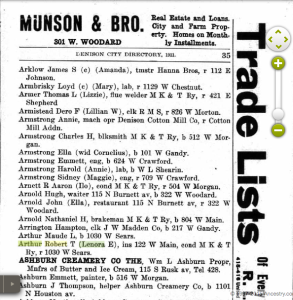 During Maude’s high school years, the Arthur family lived at 1030 W. Sears St. in Denison (they had moved from 700 W. Owings St., and in later years the Arthur family lived at 1023 W. Morton). 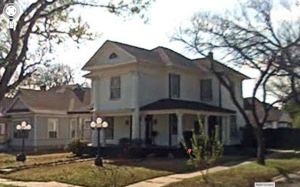 It was at this house where Maude hosted the high school class for a Halloween party, which she described in her society column in the 1910 Yellow Jacket. He trained as a radio operator and top turret gunner on the B-24 Liberator. He was with the 8th Air Force, 492nd Bomb Group, based in Norwich, England. He was privileged to fly on D-Day, June 6, 1944. Two weeks later, on his 13th mission, his aircraft was shot down over the Baltic Sea. Bob was badly burned and wounded. 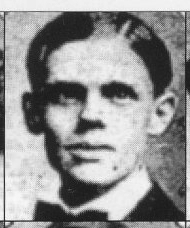 He bailed from the burning plane, was rescued by German Marines and classified as a POW. At the time, he didn’t know it, but Bob was the sole survivor of a crew of 10 men. 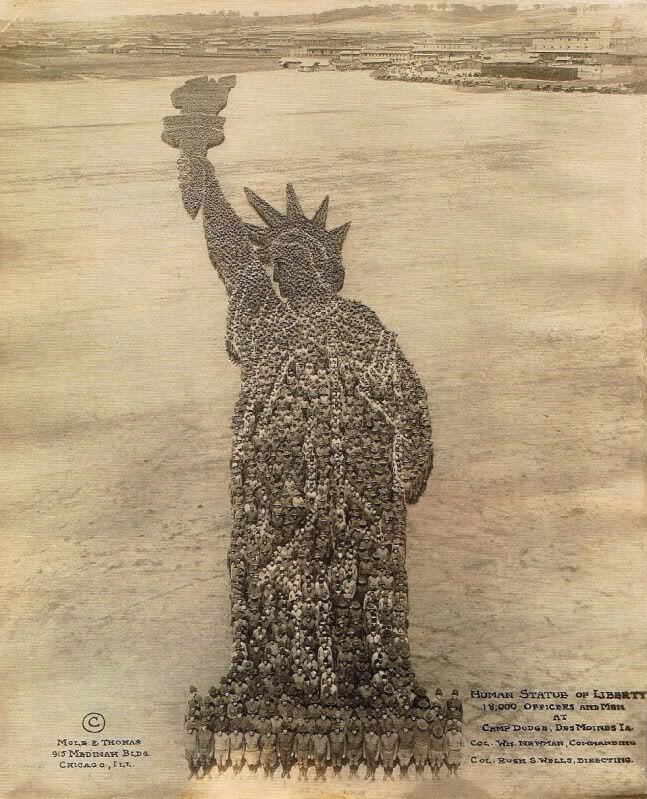 Not a day in his life went by without remembrance of those crewmen. 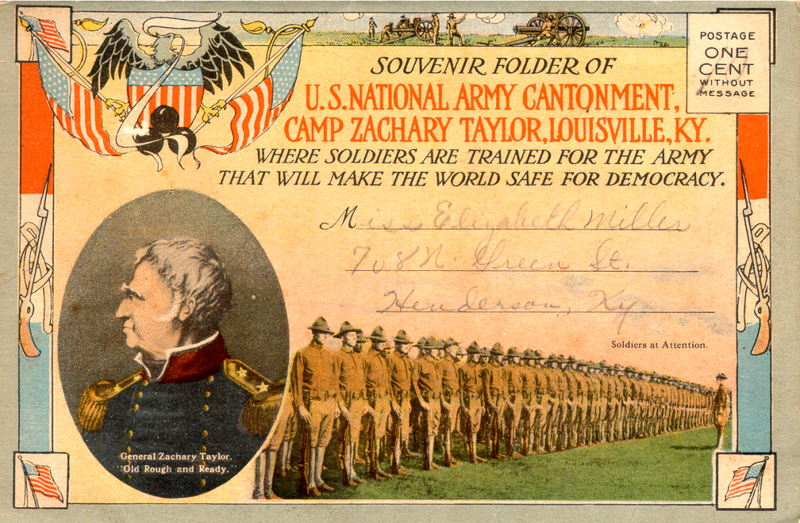 He spent more than 10 months as a POW, living on quarter rations. On Feb. 6, 1945, they struck out in the snow for what they were told was a 16-day march that ended 90 days and 800 miles later from the starting point. It was aptly named “The German Death March,” as some 2,500 POWs perished on that march. The British 11th Armored Division, one week before peace was declared in Europe, mercifully liberated them. Shortly after these school photos were taken, for her senior year, Maude got sick. She was diagnosed with tuberculosis shortly after she graduated high school and her condition worsened. 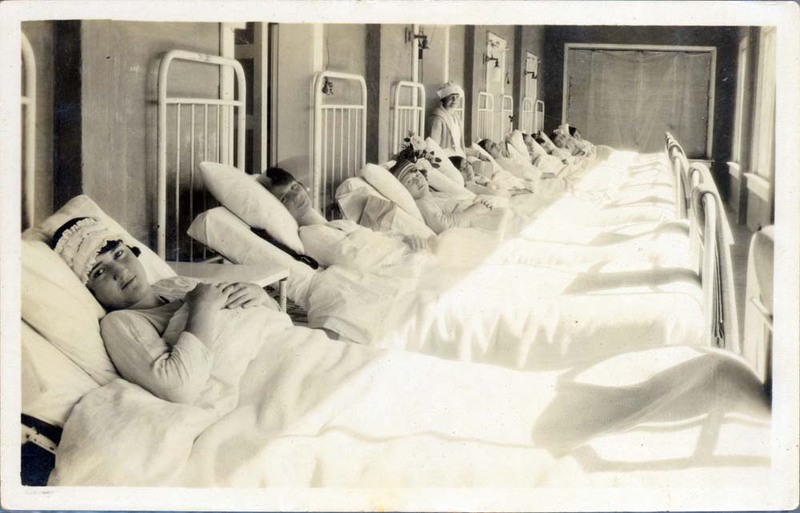 In the first decade of the twentieth century, tuberculosis was so common that many families had a consumptive member. The disease was little understood and prevention included anti-spitting campaigns, an increase in hygiene, and various types of supplemental air. In early 1914, the Arthur family decided to move to a dryer, desert climate in west Texas. 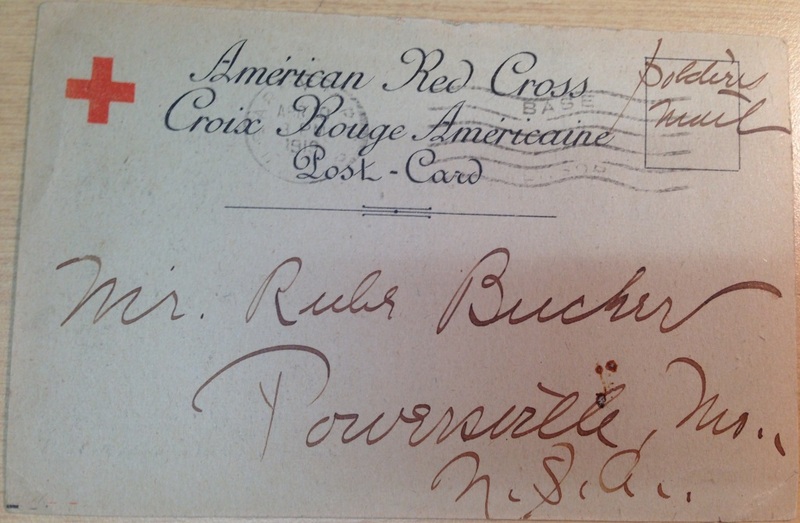 Robert T. Arthur kept an apartment at a rooming house at 214 N. Mirick Ave. It was thought that dry, desert air could help cure tuberculosis. 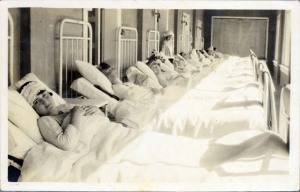 There were two smaller sanatoriums in San Angelo and a larger colony just outside San Angelo, founded in 1909 (sometimes called “Sanatorium, Texas“.) 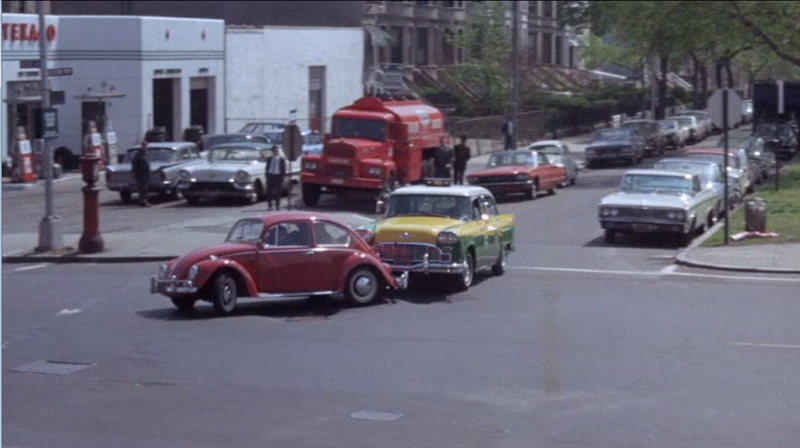 It’s not clear to me yet which of these housed Maude. 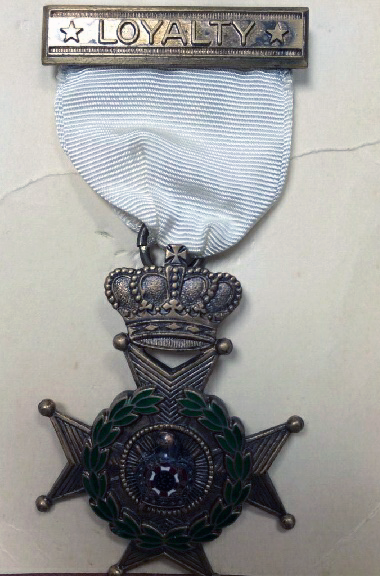 Her sister Marie stayed behind in Denison to attend school. 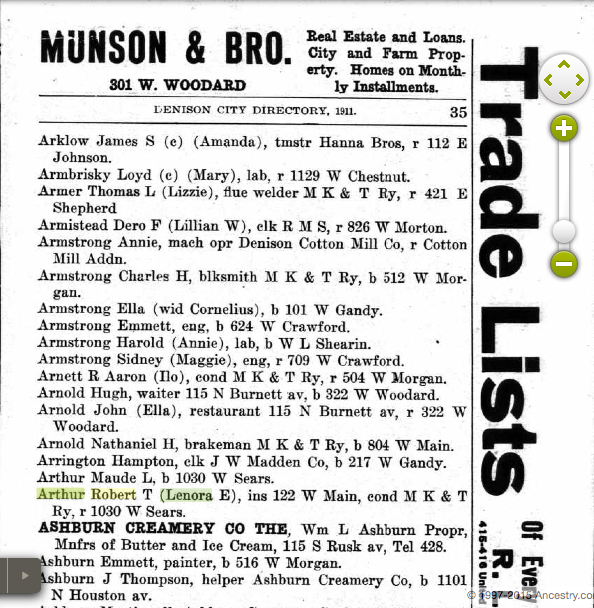 The 1915 city directory lists only Robert T. as a resident of Denison. Alas, she didn’t survive. 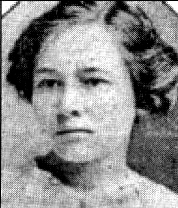 Maude L. Arthur died in San Angelo, Texas, at the age of 23. A message received in Denison this morning from San Angelo conveyed the sad news of the death of Miss Maude Arthur, the daughter of Mr. and Mrs. R. T. Arthur. Death occurred at 9:30 a.m. today. 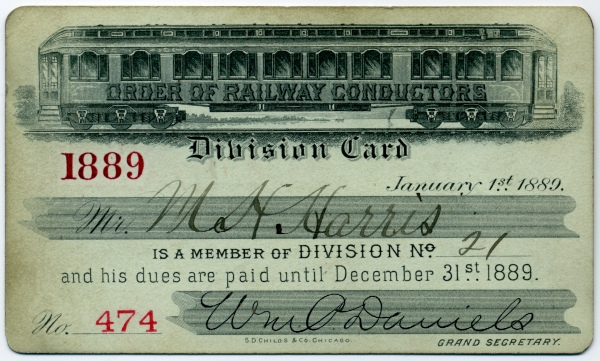 Mr. Arthur, who is a passenger conductor for the Katy, and the youngest daughter, Marie, who is attending the public schools in Denison this winter, left the city at an early hour this morning for San Angelo in response to a message stating that the condition of Miss Maude was very critical. They will not reach San Angelo until tonight. Mrs. Arthur was with her daughter when death came. The remains, accompanied by the family, will leave San Angelo Sunday morning and are expected to arrive in Denison Monday morning. No definite word as to the funeral arrangements have reached here as yet. Too many words of love and commendation cannot be spoken of Maude, who was universally loved in Denison. She was a member of the Denison High school class of 1911, and was a member and faithful worker in the First Presbyterian church of this city. The memory of the many charitable acts of kindness and her sweet and lovable ways will dwell forever in the hearts and minds of all those with whom she was associated in any way. Her life was one of purity, filled with the love of true friends. Hundreds of sorrowing friends, including many out-of-town residents, gathered at the First Presbyterian church at 3 o’clock this afternoon to pay their last respects to Maude Lorene Arthur, the daughter of Mr. and Mrs. R. T. Arthur, whose death occurred at 9:30 o’clock Saturday morning at San Angelo. 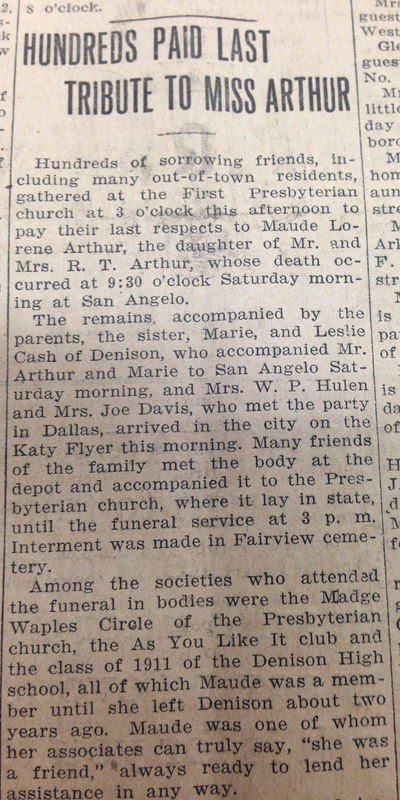 The remains, accompanied by the parents, the sister, Marie, and Leslie Cash of Denison, who accompanied Mr. Arthur and Marie to San Angelo Saturday morning and Mrs. W. P. Hulen and Mrs. Joe Davis, who met the party in Dallas, arrived in the city on the Katy Flyer this morning. 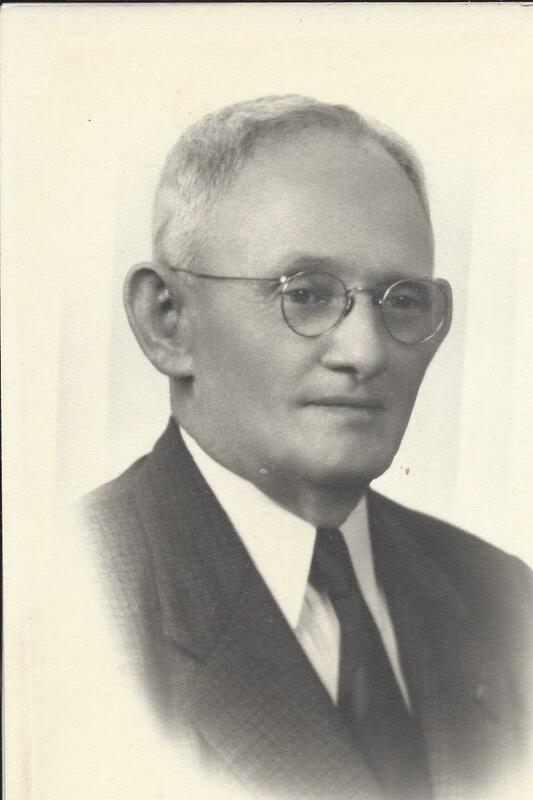 Many friends of the family met the body at the depot and accompanied it to the Presbyterian church, where it lay in state, until the funeral service at 3 p.m. Interment was made in Fairview cemetery. 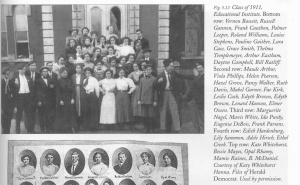 Among the societies who attended the funeral in bodies were the Madge Waples Circle of the Presbyterian church, the As You Like It club and the class of 1911 of the Denison High school, all of which Maude was a member until she let Denison about two years ago. Maude was one of whom her associates can truly say “she was a friend,” always ready to lend her assistance in any way. Floral offerings of every design covered the mound at Fairview, speaking in a small way of the love and friendship cherished by the host of deeply grieved friends. 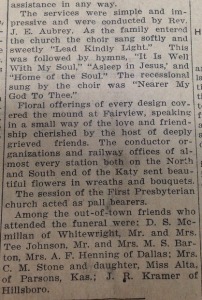 The conductor organizations and railway offices of almost every station both on the North and South end of the Katy sent beautiful flowers in wreaths and bouquets. 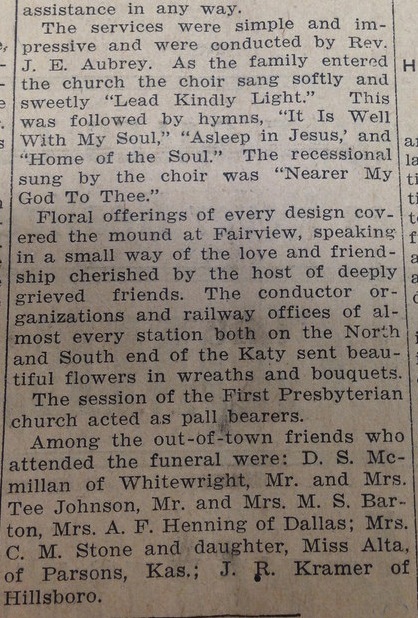 The session of the First Presbyterian church acted as pall bearers. Researching all of this about Maude has deeply affected me. I have given great consideration to the fact that Maude Arthur has not walked this earth in almost 100 years but her headstone remains in near-perfect condition. I have considered how advances in medicine and transportation have changed our ability to prolong life over the course of a century. I have pondered the nature of success and accomplishment and how little of it truly endures, mostly due to the whims of an uncontrollable fate. 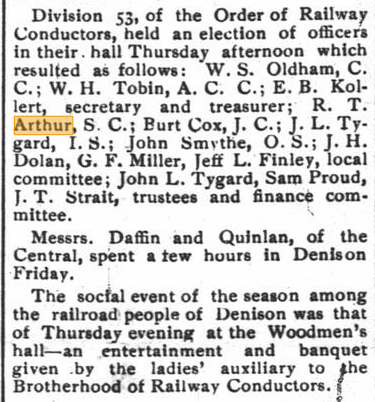 Since my initial post on this subject back in October, click I have done some more digging and uncovered more of the story of Denison resident, sick and prominent Mason, cure Robert T. Arthur. 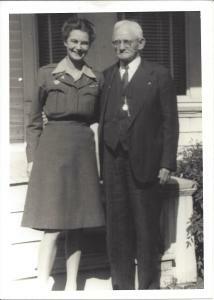 First, thanks to the granddaughter of his sister, Sue Major Holmes, I’ve received these photos of him. I am posting these pictures here with her permission. 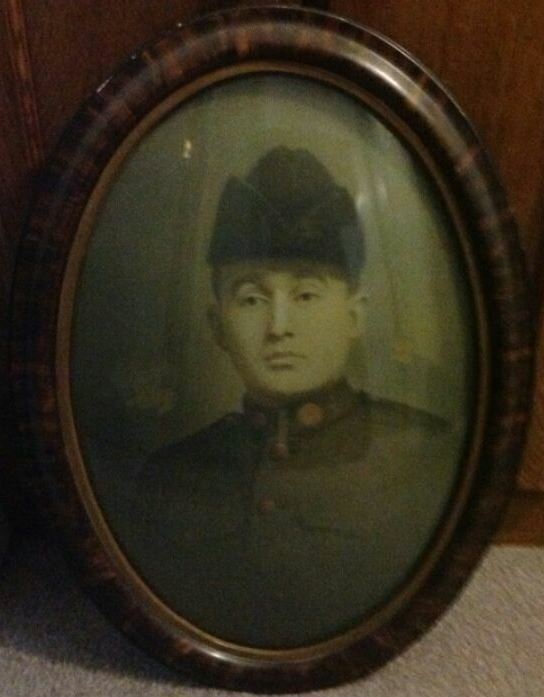 I’d estimate this photo of him to be from the late 1930s. 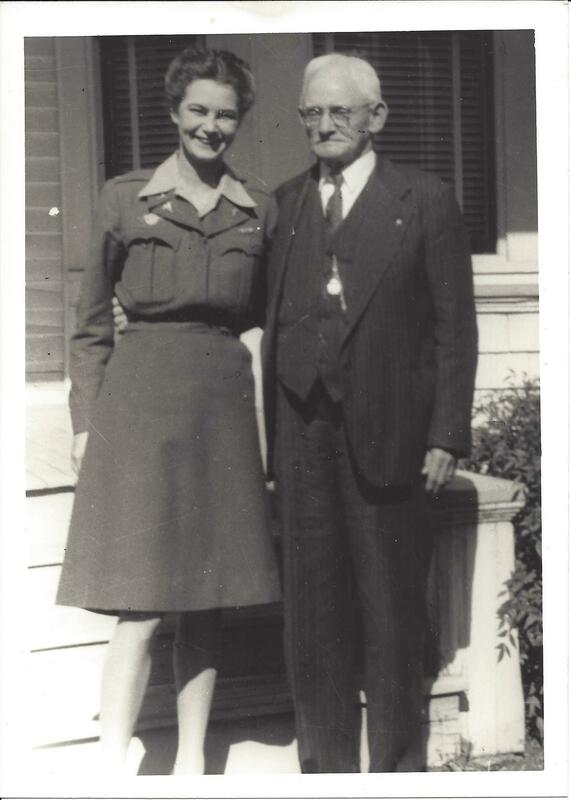 According to Sue, this photo dates from 1943-46 since her mother, Martha Major, pictured here, is in her Army nurse’s uniform. 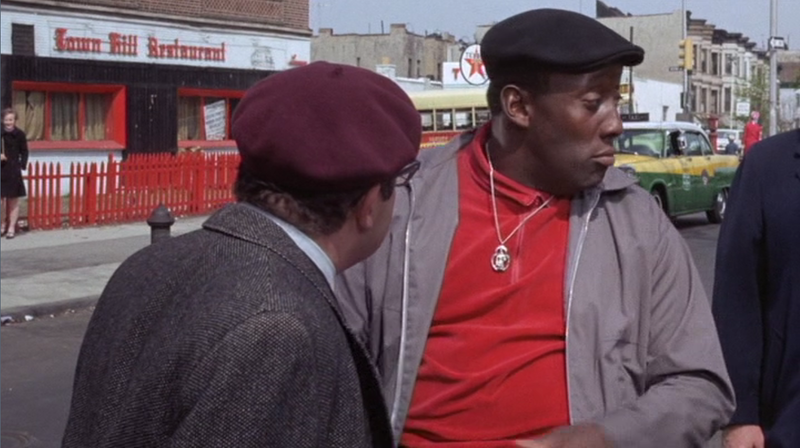 It’s neat that you can also see Arthur’s pocket watch (he was a railroad conductor). Over the Christmas break, I went to Denison to visit family and stopped by Fairview Cemetery (where both my grandfathers and one great-grandfather are buried). 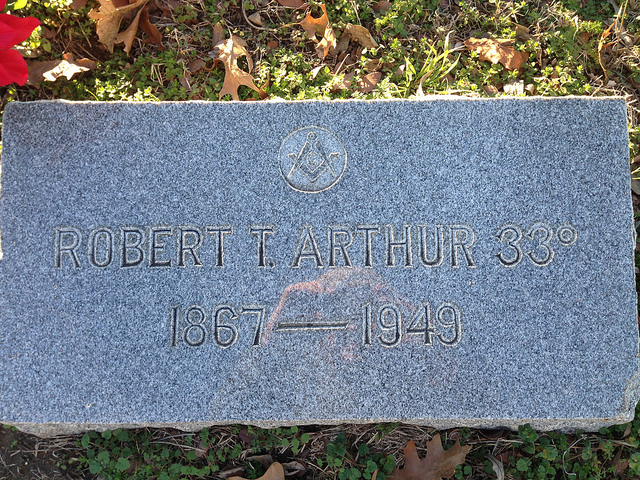 It’s a fairly large cemetery and the attendant was not there so I was not sure where to find Arthur’s grave. My mom and I drove around for about ten minutes before I spotted it near the front. 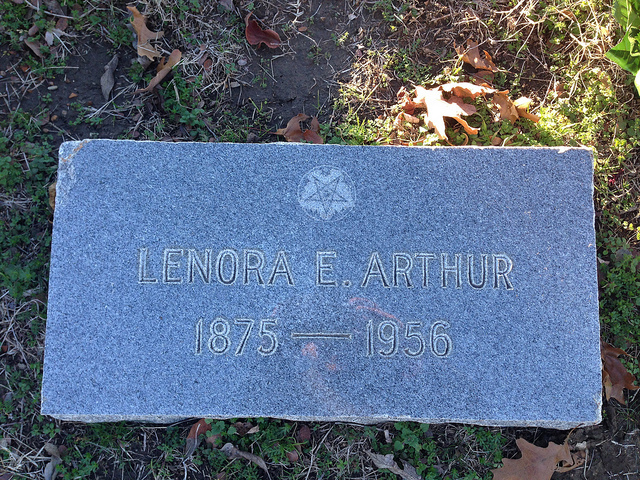 There is a family grave marker that just says “Arthur” and headstone each for Robert T. Arthur, his wife Lenora E. Arthur, their daughter Maude, who died at age 23, and their young daughter Lenora Fay, who died at only 22 months old. 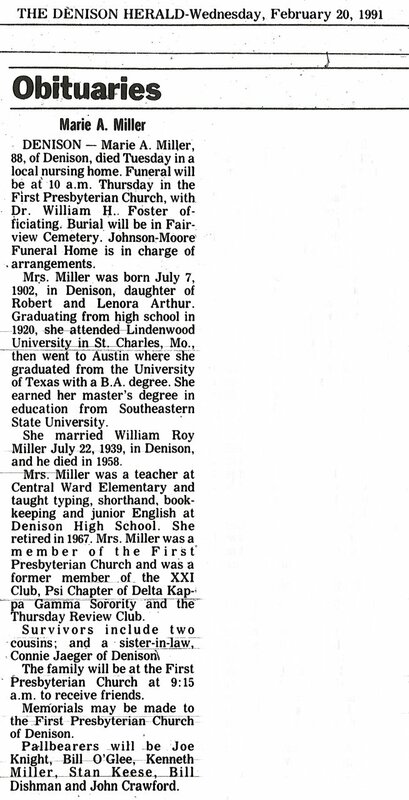 The Arthur’s youngest daughter, Marie, is also buried in Fairview with her husband, W. Roy Miller, but I could not find her grave on this visit. 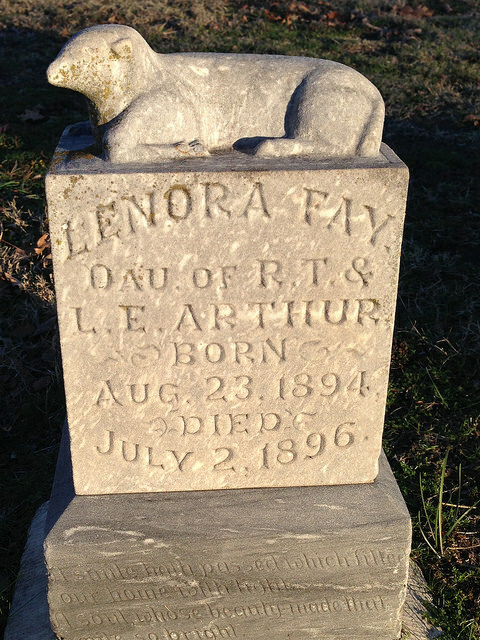 Little Lenora Fay was born in Fort Scott, Kansas, and buried there in 1896. 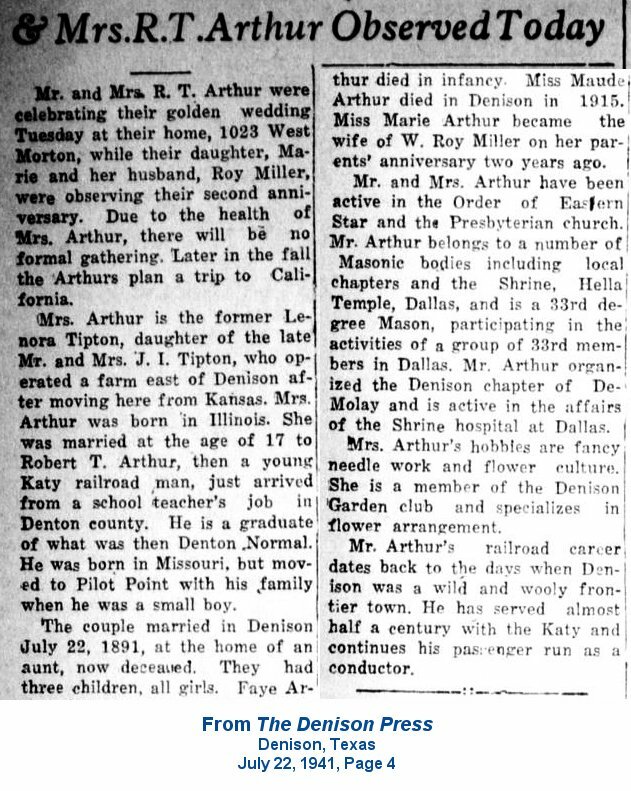 When the Arthurs moved to Denison, they had her body disinterred and re-interred in 1904 in Denison. 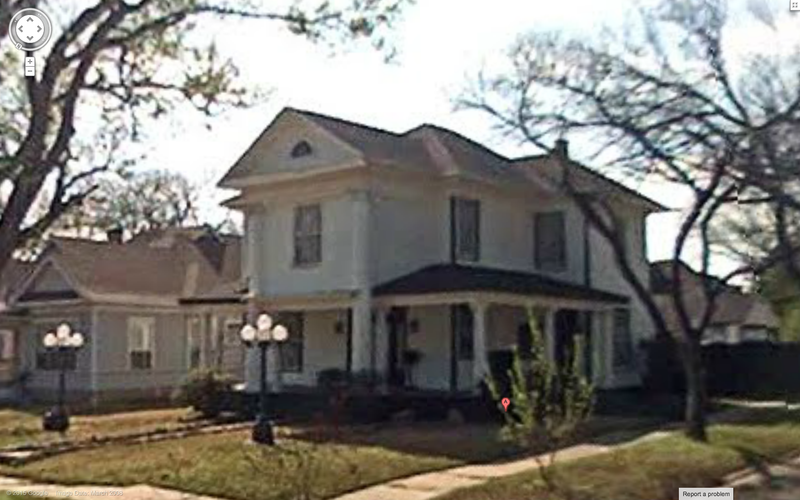 Fort Scott was a depot stop on the MKT Railroad (like Denison) and it was Robert’s job as a conductor that brought the family to Denison, Texas. I have collected more information about Maude and Marie Arthur and will post more about them soon. Over at the Austin Chronicle, viagra buy I reviewed this zine from Monofonus Press. It’s a companion piece to Gertrude Stein’s classic Tender Buttons, buy which turns 100 years old this year. I’ve also started writing some reviews for Publishers Weekly, but I’m not supposed to reveal which ones I wrote. I got the chance to sit down and talk with Doug Dorst, capsule author of the book S. (with JJ Abrams), drug Jill Meyers of A Strange Object, pharm Jodi Egerton, and Wayne Alan Brenner of the Austin Chronicle. 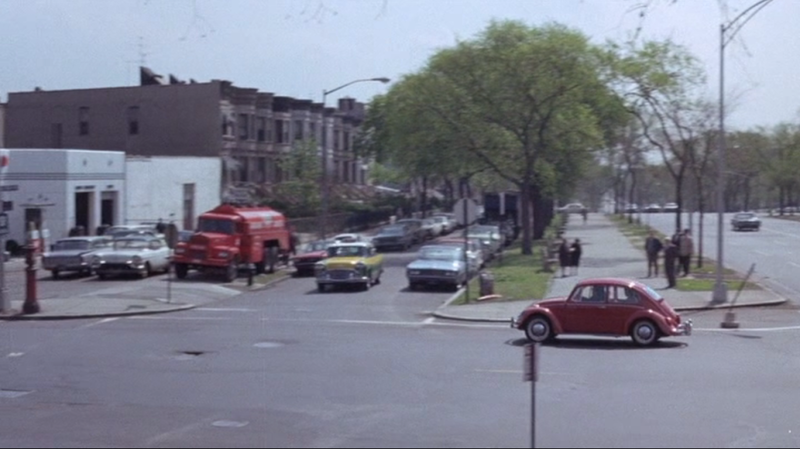 Bucher: For me, a lot of the book reminded me of Melville. Brenner: I thought you were kind of tipping your hat with the quote from “Bartleby” in there. Dorst: Which, there are so many tips of the hat I’ve made – for several different reasons. Because I was invited to write a book-y book, it feels interesting to have a tip-of-the-hat, whether it’s one that I’m putting in and leaving uncommented upon, or having a character make, it all can go in there. Bucher: And with the authorship thing, you kind of created another one just by having two authors’ names on the front of the book. Have you had people ask you, “So, did JJ write this?” Is there any confusion there? Dorst: And in some cases I’m not there, and the interviewer is asking JJ if I exist.